Dana White: Belfort up next? How about Silva-Weidman III? The UFC president is not ruling out a rubber match between Chris Weidman and Anderson Silva. After knocking out his third straight opponent in highlight-reel fashion, Vitor Belfort was anointed the middleweight division’s No. 1 contender in waiting. His recent resume had become too impossible to ignore. Three-straight headkick knockouts, including one of the iron-chinned Dan Henderson, had vaulted him past the pack. All he had to do was wait for Chris Weidman and Anderson Silva to take care of their business. 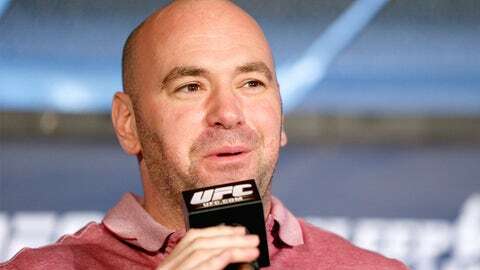 That was reaffirmed during Thursday’s UFC 168 press conference, when Dana White publicly said again that Belfort had to be next up for the winner of Saturday’s main event between Weidman and Silva. What happens if Silva wins? And what happens if he does so in some controversial fashion? There might have to be some scenario that would lead to an immediate trilogy fight, right? So clearly White is hesitant about trying to sell the public on three fights between Weidman and Silva in such a small window of time. And the participants might not necessarily want to head right back to another rematch, either. On the other hand, it’s not something that we can 100 percent rule out. The 36-year-old Belfort is the No. 1 contender. Unless something crazy happens. But then again, this is combat sports. Something crazy happens quite routinely, doesn’t it? A potential rematch between Belfort and Silva would be huge in MMA-crazy Brazil, and in some ways, the first fight between them reignited the country’s passion for the sport, so a second fight would be brining the story full circle. If Weidman defeats Silva again and retains the belt, his star power will be bolstered by doing the seemingly impossible twice, and the hope is, it will help to turn him into a pay-per-view draw in an intriguing match opposite Belfort. On the other hand, a close fight between Weidman and Silva would at least plant the seeds for a third fight, though selling a trilogy in about one year’s time would be a marketing challenge in a climate where the entertainment dollar is already stretched thin.